Digging a trench for sprinkler systems, water pipes, electrical lines, etc. can be a tedious and back-breaking job. Yet, there is hope to make this job easier right inside your rental store with a Ditch Witch trencher! And it won't damage your turf like heavier equipment. It will not be much of a problem for you to make a straight trench with a Ditch Witch, even if you are a beginner. When trying to get the Ditch Witch where you want it, leave one of the wheels freewheeling so you can pivot it more easily. However, once it comes time for trenching, make sure that you lock the drive wheels. The maximum depth varies with different models of Ditch Witches so check with your retail center for the specifications on the model that you are renting. The tool works as a giant chainsaw on wheels; it moves in reverse towards the user so be careful when operating. 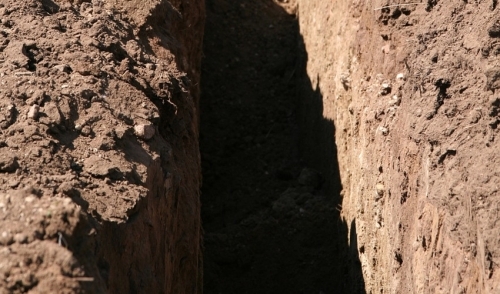 CAUTION: Always remember to check where the underground lines are before digging to prevent any mishaps!